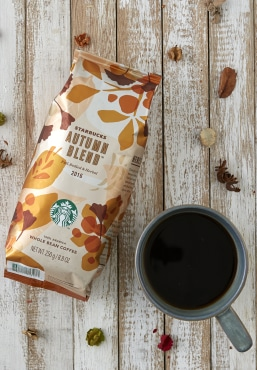 Autumn Blend combines Indonesian and Latin American coffees with subtle notes of spice, cocoa and hints of fine herbs. This spicy, full-bodied blend of coffees from Sumatra and Guatemala’s Antigua region reveals subtle herbal notes when paired with a savory main course. And with its syrupy body it’s perfect for lingering over buttery desserts late into the night. It’s features a big cup with medium acidity, full body and a round mouth feels. And it’s give it a lemony, citrus finish. Your family and friends as dessert is being served.